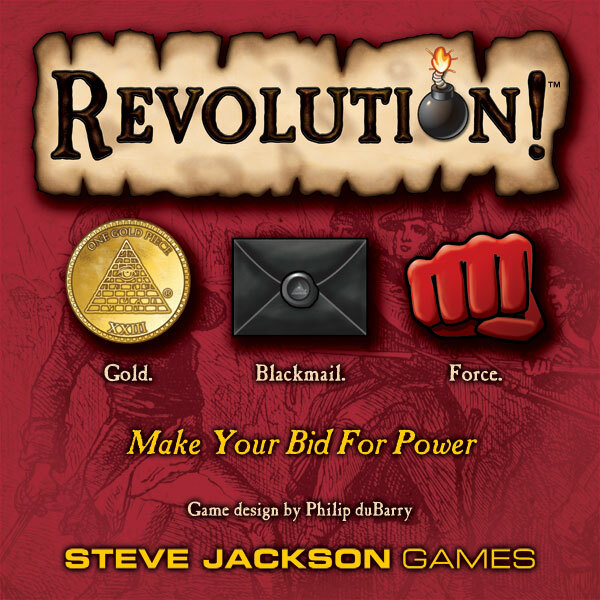 Since its release in the fall of 2009, I have been asked about effective strategies to employ in Revolution!, my first published game. This topic has generated a fair (and, to me, surprising) amount of discussion on Boardgamegeek. Some claim that the game is "broken" because they isolated an unbeatable strategy during their first play. Others suggest that no strategy is possible due to the supposed randomness of the game. Here are some of my thoughts on the matter, based on my experience from many, many sessions. One of the first things players notice is the powerful connection between the General/Admiral (which give you Force) and the Innkeeper/Magistrate (which give you Blackmail). 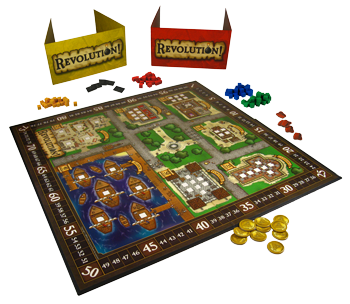 This pattern allows a player to win one pair and use those tokens to dominate the other pair next turn. Some have referred to this as an "engine," similar to those in other Euro games. Another such engine can be found in the Aristocrat/Merchant and the Rogue/Mercenary. These engines give you a good foothold in some very support-rich buildings but leave you open to attack from the Spy and Apothecary. The back-and-forth pattern also tends to be very predictable. One Gold more than the "usual" bid can throw one of these engines into chaos. Another attractive strategy is to always win the Printer. With his 10 Support, the Printer can certainly propel you far beyond the other players on the scoring track. Of course, most of the points will be won at the end of the game by controlling the buildings. This strategy is always a gamble – the other players need to split the buildings pretty evenly, perhaps even tying a few. They also have to let you win the Printer without too much fuss nearly every round. Many new players like to focus on the Fortress with its 50 Support. However, the Fortress is seldom won without a fight. Often the cost can be too high in terms of lost opportunities. One of the worst things you can do in Revolution! is fight directly with another player. Sometimes this cannot be avoided, but it usually redounds to the benefit of the other players. Conversely, an excellent strategy is to push players into fights with each other with skillful use of the Apothecary and subtle table-talk. The Palace expansion, released in 2010, further complicates the above analysis. The four additional spaces on the bid board lead to an even more fluid game. Randy Scheunemann, the only person who's played the game more than myself, taught me a cruel opening trick to play against a table of newbies demoing The Palace. You do what you can to win the Viceroy, Messenger, Mayor and one other cube-yielding space (say, the Aristocrat or the Merchant). None of these spaces are very attractive to new players, so it can easily be done. The Messenger can be used to move the Guardhouse cube and one other to the Palace. The Mayor adds one more. So you end turn one with four cubes in the Palace, a devastating lead in the highest-scoring building! So what is the best strategy? First of all, watch the other players – find patterns. You want to get the most characters for the best price. In the beginning it doesn't even matter which ones. You just need to find some bargains. Go where the other players aren't going. Then once the game progresses a bit, target at least two buildings and also work to gain the better tokens. You may occasionally be able to get out of sync with the other players – you have Blackmail and everyone else has Force or Gold. Next round you have Force and they all have Blackmail. This is perfect! Another thing to watch is the support track. You really can't afford to lag behind the crowd by too many points. Always try to stay within striking distance and then make your final push for points and buildings at the end. Don't be afraid to table-talk and collude with those around you when necessary. Above all, keep your options open and your opponents guessing. Ultimately, you're not playing the game, you're playing the people. 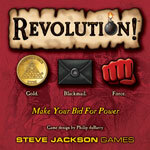 I hope these hints will put you on the path of victory in your next game of Revolution!